Want to know the benefits of CPA self study through distance education? Have been wondering if it is possible to clear CPA exam through self study kits as well? Read this blog further to know which is the most comprehensive distance learning package for CPA self study. The saying “Push yourself because no one else is going to do it for you” could not be more apt when you need to motivate your own self to succeed and excel in studies in order to have a prosperous career. CPA distance education is one such program that enables you to push through your limitations of learning. Clearing a CPA Exam on the first attempt is eminently possible should you use an appropriate CPA review. However, if the chosen review falls short of expectations, you may not get the desired results. This is where the self-study material of an ‘appropriate’ review comes to the rescue wherein the study material allows you to work through a course on your own time and also emulates examples of actual exam papers so that the candidate gets a look and feel of the actual paper in a practice scenario. This gives the candidate a ‘been there; done that’ experience when s/he takes the actual exam. Nothing can replace a live review course for preparing for a competitive exam like the CPA (USA), but because of time or location constraints, a good self study CPA study material provides you with tools at your disposal that can be used at one’s own pace. To succeed in a course like CPA, flexibility is the key essential ingredient to understand the course in depth. In a live review course, a genuinely good instructor who has the subject expertise, would make it possible to understand each topic with ease. But sometimes it may so happen that the instructor might not do full justice to the topic which may lead to a lack of adequate knowledge transfer which might adversely affect performance in the examinations. CPA self-study materials that include books, videos, lectures, audio reviews and CPA exam study tools are extremely useful to the candidate as the candidate does not have to rely on an instructor to clear any doubts as the reference materials help provide answers to any doubts which might arise. With the CPA study kit material you study at your own pace. You can schedule your study pattern as per your ease and convenience and even when you are travelling as it is a distance education. Further, self-study material for CPA is comparatively economical compared to a classroom. Having noted the advantages of a self- study material of CPA, it is even more crucial to decide as to which is the most appropriate material that one should choose. Amongst all the materials available, the Gleim CPA Review kit gives the most complete package for all your study needs. The review kit helps you adapt to the course comfortably by breaking up the complexity of the subjects into simple explanations that make it easier for the candidates studying to grasp the different concepts easily. The course also gives you ample practice material that mimics the real exam questions. This makes the candidate very familiar with the entire exam process, including the screens, which prevents anxiety and takes away the tension while taking the actual exam. Gleim CPA Review kit also possesses a unique feature of being a collaborative study planner coupled with smart analytics to keep you on the course track. The Gleim CPA review kit is brought to you in India by Concorde Academics P Ltd (Concorde), Gleim’s authorized representatives in India. The kit is all inclusive and comprises of the following: Textbooks, Test Prep Software (Question Bank), Digital Book, Audio-Visual Presentation, Gleim Instruct Video Series, True/False Study Questions, Multiple-Choice Quiz, Simulation Wizard, Audio Review (Downloadable), Exam Rehearsal, Online Access- Until You Pass, Personal Counselors, Access to Accounting Experts, Study Planner. 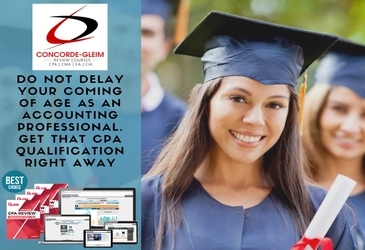 With so much systematically structured material available from Concorde, one can now study through distance learning and move a step closer towards clearing the CPA exams. So if you want to hit new heights of success along with a bright future in the financial world do not prolong any further and get yourself the Gleim CPA Review kit and see the difference!